The aortic valve is the exit point for blood being pumped to the rest of the body, regulating the single-directional flow of blood out of the heart. If the valve cannot open completely (aortic stenosis), the heart is forced to pump harder against the narrowed opening. Conversely, if the aortic valve does not close completely (aortic regurgitation or insufficiency), blood can leak back into the heart, causing strain on the heart. If left untreated, both pathologies will eventually lead to heart failure and reduced life expectancy.. 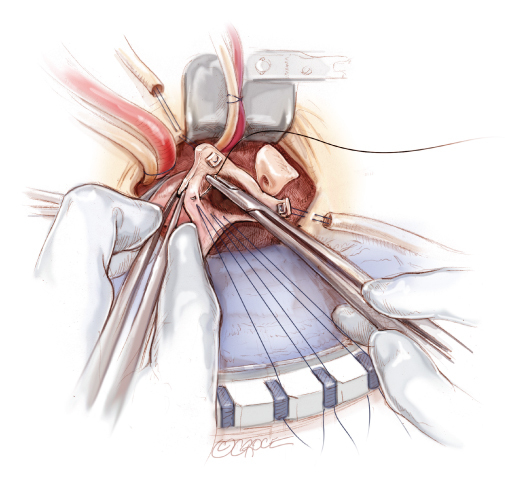 The suitability for minimally invasive aortic valve replacement is assessed on an individual basis. Approximately 85-90% of patients are suitable for a minimally invasive approach. Often it depends on the heart function, chest anatomy and co-existing medical conditions. Another important issue that needs to be considered is whether a mechanical or a tissue valve is more suitable for the patient. A mechanical valve is very durable, but it requires blood thinning medication (warfarin) for lifetime. A tissue valve does not require warfarin, but may only last for 7-15 years.